Ballymena manager David Jeffrey is aiming to close the gap on Glentoran, when United travel to Dungannon Swifts, on Tuesday night (8pm). United, currently sit eight points behind sixth placed Glentoran but they have played three games less. “The line has been drawn under the League Cup Final and tonight’s game is about us going to try and pick up valuable league points,” he stated. “Glentoran have stolen a bit of a march on us in terms of that sixth spot, so it’s vital we get something from the game. Jeffrey says a top six spot remains the target, but he’s realistic about the challenge that presents. “People need to have a bit of reality,” he added. “When Bryan McLaughlin and I came they were heading for relegation. “Now in terms of where we got to last year we did remarkably well. There was so many firsts last season and we certainly achieved more than what we could have wished or dreamt for. “This year has certainly been very challenging and I want to put on record in the 20 years that Bryan and I have worked together we have never experienced an injury list like it. p Oran Kearney says Coleraine’s focus will be firmly on the job in hand when they travel to Ballymena United on Saturday. With Crusaders travelling to Cliftonville in the day’s other derby clash many Bannsiders will be hoping the Reds can do them a favour. Kearney though is only concerned about what his own team does on the day. “As we always say, we can only control what we do,” said Kearney. “If Crusaders are to drop points some week then we have to be in a position to take advantage of it. “So we will take care of our own business first and foremost. 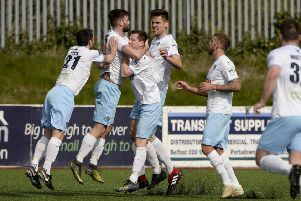 It was a frustrating Saturday for the Bannsiders last weekend as their Irish Cup quarter final fell foul to the weather. Kearney though admitted it was the right decision by referee Raymond Crangle. “He made the decision inside 10 seconds, and it was the correct one,” he said. “The snow wasn’t an issue, the pitch was frozen and Raymond couldn’t let it go ahead. “Yeah, it was frustrating as it was a big game and a big crowd expected, but as I say, it was the right call. “At short notice we took a side up to play a behind closed doors game against Derry City.